The key principal behind They Ask You Answer: A Revolutionary Approach to Inbound Sales, Content Marketing, and Today’s Digital Consumer by Marcus Sheridan is simple. All content should serve a need for your customer. That’s it. Nothing revolutionary like the title claims. It’s a super easy concept that shouldn’t need an entire book to explain. And yet, most businesses engaged in creating content miss this point by a mile. Content must serve the need of your customers or potential customers. When people head to Google to, they’re looking for answers. Unless your content answers their questions, it’s unlikely to be found. Your potential and current customers are asking these questions regardless of if you’re answering them. If you aren’t the one providing the answers, they’re going to get them somewhere else and it’s most likely from your competition. We don’t go to Google, search for a question and then stop if the first site we click doesn’t have the answer. Even though you manage to rank for that question, if you don’t provide the answer they’re searching for, they will look elsewhere. While the content of the book is basic Content Marketing 101, it’d be a good starter for those interested in learning to build a quality content marketing program. Understanding that content must serve a need of the viewer, not simply the creator, is a concept many companies still fail to grasp. It’s also a nice reminder to experienced marketers who may have allowed their content to drift from helpful to self-fulfilling with time. While They Ask You Answer may not offer anything revolutionary or even new for those experienced in content marketing, it does provide a good starting point for a content program, along with an understanding what your content must give viewers in order to be successful. 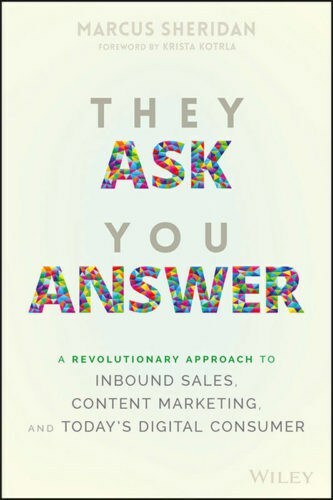 If you’re looking to get started creating content people actually want to consume, check out They Ask You Answer: A Revolutionary Approach to Inbound Sales, Content Marketing, and Today’s Digital Consumer on Amazon now. The world of content could use more quality to cut through all the self-serving crap.